Fully customize your iron door using your desired style, measurements, color, glass, finish, hardware, and more. 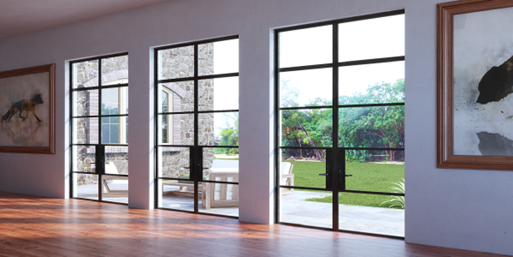 These grid-style steel entry doors and windows are modern and sophisticated in every way. Check out our Gallery below to view stunning examples of our placements. The beautiful, warmer days of spring have us all thinking about getting outside and sprucing up our homes. Planting a few flowers and bringing back that neglected curb appeal seem to fill up those Saturday to-do lists during the spring. 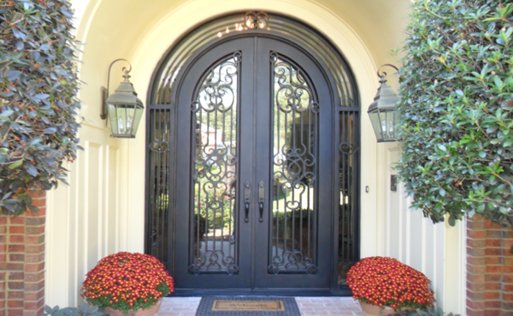 For homeowners with wrought iron doors, cleaning and maintaining that focal point should be on the top of the list. While wrought iron doors are made with the highest quality materials and can withstand most extreme weather conditions, they are still prone to wear, especially rust build up. Properly cleaning your wrought iron doors will help protect your investment for many years to come. Make your own soap mixture to use. Plant based soaps are safer to use on the doors because of their alkalinity. To make the soap, mix a teaspoon of liquid Castile soap with water. Stir the mixtures until small suds begin forming. Using a clean cloth, wipe the wrought iron with the soapy mixture. For the best results, work your way from the top of the door to the bottom. Rinse the soapy mixture off by spraying the door with a hose. Dry the door with another clean, lint-free cloth. If you live in a coastal community or an area of high humidity, your iron doors will likely develop rust on the frame. It is extremely important to clean the rust in order for the door to maintain its look and durability. Begin by scraping the rust off of your door using a wire brush. A drill with a wire-brush attachment or sandpaper can also be used to remove the rust and flaking paint. All of the paint does not have to be removed, as long as, all of the rust has been eliminated. Next, clean the door using the above steps.Do not use the primer until you are sure the dry is entirely dry. After a thorough cleaning, apply a rust-inhibiting primer to the entire door, making sure that all sides of the wrought iron are covered.The specific instructions vary depending on the primer product you select. Be sure to follow the directions on the package exactly as specified. Once the primer is completely dry, apply the metal paint color. The frequency of cleaning your doors depends on where you live. Those who live in more humid areas should probably clean once a month. Regularly checking the doors for rust is important to make sure they stay as beautiful as the day they were installed. Maintaining your doors takes effort, but the effort is totally worth it! If you have any questions about cleaning and maintaining your doors, call on us today! First Impressions: What does your front door say about you? 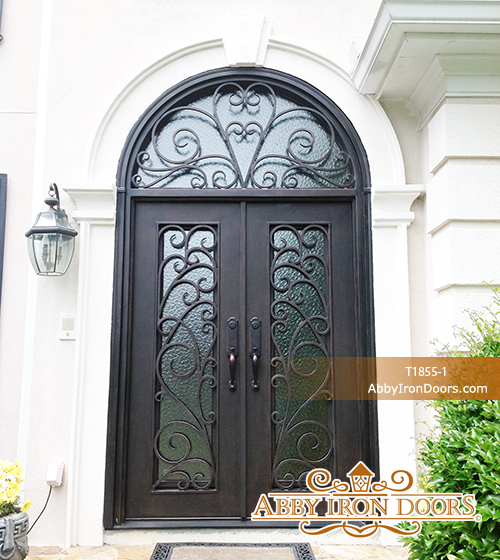 How do you know Abby Iron Doors?